Krém na nohy s aloe vera s hydratačnými vlastnosťami. Obsahuje ekologicky pestovaný olivový olej a aktívne organické aloe vera. Ľahko sa vstrebáva a ponúka svieži pocit a hĺbkovo hydratuje vaše nohy. Ingrediencie: Aqua (Water), Cyclopentasiloxane, Ethylhexyl Palmitate, Ethylhexyl Sterate, Glycerin, Sodium Polycrylate, Panthenol, Aloe* Barbadensis Leaf Juice Powder, Helianthus Annuus (Sunflower) Seed Oil, Olea Europaea (Olive*) Fruit Oil, Menthol, Allantoin, Glyceryl Sterate, PEG-100 Sterate, Dimethicone, Caprylyl Glycol, Parfum (Fragrance), Tocopheryl Acetate, Disodium EDTA, Phenoxyethanol, DHDM Hydantion, Benzyl Alcohol, Hexyl Cinnamal, Linalool, Benzyl Salicylate, Limonene, Butylphenyl Methylpropional, Geraniol. Foot cream with hydrating properties. 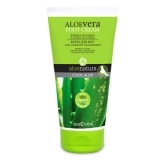 It contains olive oil organically cultivated and active organic Aloe Vera. 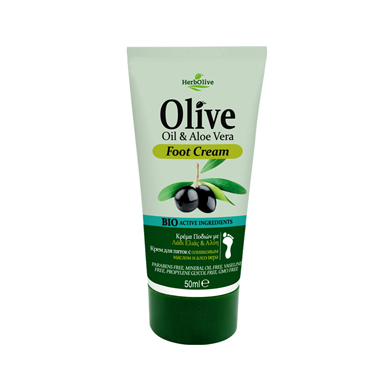 It is easily absorbed and offers a freshness sensation and deep hydration to your feet.